Our artist's own original and unique wood mosaic pattern is cut from solid pine, providing the perfect background definition and shape for YOUR favorite horse's next portrait! All pieces are hand cut, expertly sanded, then glued together and meticulously hand-painted to match photos you provide of YOUR horse. Portraits are lacquer sealed to preserve and ensure a long-lasting finish and years of enjoyment in any indoor environment. Perfect for bedrooms, offices and dens, they also make very nice awards at the end of a memorable show year. Great item for fund raisers for your riding club auctions. This talented artist makes every effort to capture the spirit of your horse, paying close attention to the detail of the eye and any special markings. After the painting is completed, you will receive an emailed photo of the portrait. Your approval before we ship is essential to ensure your complete satisfaction with your horse's portrait. 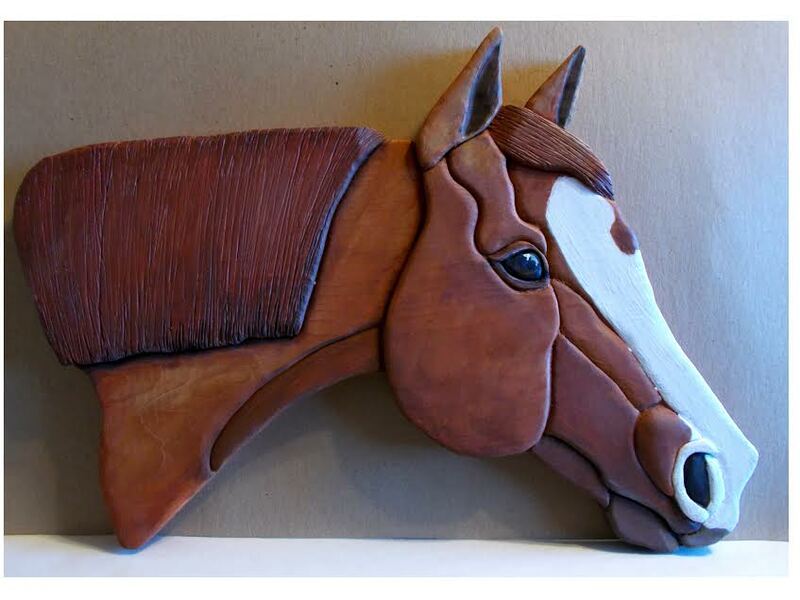 ~NEW OPTION - we can add YOUR horse's actual mane or tail hair to the mane and forelock, adding texture to this piece! What a nice memento, too! Click on photo to see sample. The portrait is approx. 11" high x 12" long. After placing your order, you will receive an email asking you to forward a photo of your favorite horse, including special markings and clear eye detail. Please allow up to 4 weeks for the preparation and shipment of your portrait. If you need it by a special date, please feel free to call me to discuss expediting other and shipping options.